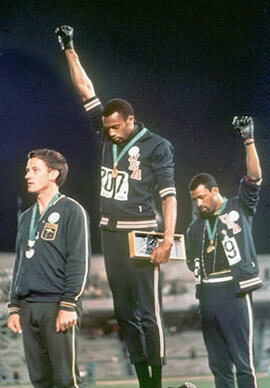 This weeks pick examines the role that sports can play in political matters by examining the events that took place in the Olympic Stadium in Mexico in 1968 which culminated in two medal-winning athletes giving Black Power salutes from the podium. Other political programming this week explores issues such as intolerance of the Muslim community, the encroaching impact of privatisation within the NHS and the reaction of even those traditionally seen as conservative to it and the latest scheme to attempt to reduce youth crime. At this time of the third anniversary of the London 7/7 bombings, Peter Osbourne questions whether the fear of terrorism has led to a growing intolerance of the Muslim population. The inflammatory role of the media is examined and there is also a report on the poor relations between the Muslim community and the security services. This investigation into the growing inroads of privatisation into the NHS focuses on the reactions of the British Medical Association to recent governmental plans to introduce new "polyclinics". Normally conservative GP' are so concerned that this will lead to the closure of traditional surgeries that patients are being asked to sign a petition in opposition to the plans. This somewhat unsubtly-titled new series begins in the first broadcast with former Home Secretary David Blunkett heading a parole board as ten "juvenile delinquents" are locked up with reformed criminals in a bid to prevent them embarking on a life of crime. This critically lauded documentary is billed as being that rarity - a high quality, incisive and informative portrayal of politics within sport. One of the most visually stunning and emotionally powerful images within sport or politics occurred at the 1968 Mexico Olympics when 200m medal-winners Tommie Smith and John Carlos gave Black Power salutes from the podium. Their silent, powerful protest was the culmination of a dynamic and determined protest campaign from US African-American athletes and their supporters in which, among other actions, Ali's world boxing title was restored, Olympics boss Avery Brundage was sacked for his Nazi sympathies and racist South Africa were excluded from that Games. All the main players at that time are interviewed, including Smith and Carlos. This biographical drama, showing in the early hours of Thursday morning, stars Ryan Gosling and tells the true and shocking story of a young Jewish man who became a neo-Nazi. This intelligent biographical wartime drama critiques the self-appointed role the US has a tendency to take as the world's policeman. Harvey Keitel, under the direction of Hungarian Istvan Szabo, plays the arrogant war crimes investigator who attempts to impose his perceived moral superiority on an orchestra conductor accused of glorifying the Nazis. The link between art and power is also explored in the complex portrayal of Wilhelm Furtwangler, known as "Hitler's favourite conductor", by Stellan Skarsgard.